Oh my! My baby girl is 5. I am thrilled to be the mother of this amazing not-so-little-anymore girl. We had an amazing weekend celebrating her – a school celebration, party with friends, Frozen at Jack Trice, a sleepover with a cousin, a family party and dinner – with ice cream! – at Hickory Park. Chloe Mae is our self-proclaimed ‘remember-er’ of all things. She is emotional – for better or worse. She is inquisitive and so happy to learn. She is creative and I’ve become experienced at sneaking many of her creations into the recycling bin, because no matter how many we give away and mail to friends, there are just too many. She loves to sing, dance and perform for anyone who will watch. She is a very loving, caring girl who likes to take care of her brother, even when he doesn’t want to be taken care of. She tests my patience every day, but there are also daily reminders of how lucky I am to call myself her mom. I asked her 20 questions again. Here are this year’s answers. What is your favorite fruit? Bananas. What is your favorite TV show? Sofia the First. What is your favorite thing to eat for lunch? Macaroni and cheese. What is your favorite outfit? White Sofia shirt and a skirt. What is your favorite game? Hide and Seek. What is your favorite snack? Cheese and crackers. What is your favorite animal? Monkey. What is your favorite book? Amelia Bedelia. Who is your best friend? Nya. And Katelyn. What is your favorite movie? Frozen. What is your favorite thing to do outside? Go on a walk. What is your favorite drink? Milk and lemonade. What is your favorite holiday? Valentine’s Day. What do you like to take to bed with you at night? George and monkey and my Tangled blanket. What do you want to be when you grow up? A dancer. 7:15 – I decided to make Grammie’s Waterloo Muffins for breakfast. 7:30 – Aaron was biking to work and ready to head off, so I said I’d just grab a shower later. 8:20 – We were on our way to drop Chloe off at school. I had changed out of my pajamas…into leggings 🙂 We listened to Happy by Pharell Williams a total of 3 times on the way to and from C’s school. 8:45 – Devon had a dry diaper when I checked him, so he sat on the potty and peed. Good work, kid! 8:54 – I noticed D was a bit gassy, so I asked if he needed to go back to the potty. He said no, he was fine. 8:55 – D told me he had a poopy diaper and needed to be changed. 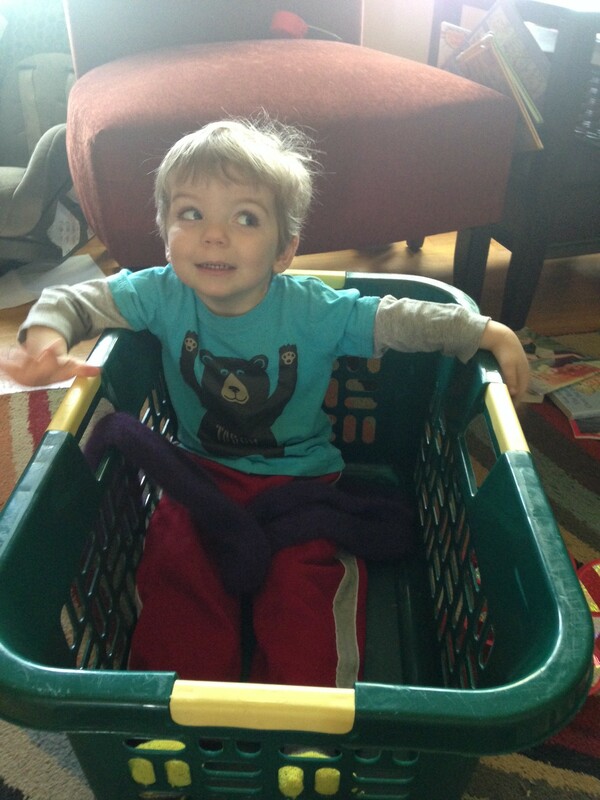 9:05 – I put away the 4 baskets of laundry that had been done over the weekend. I had a tiny helper, so it took a while. My tiny helper made an empty basket into a carseat, complete with a scarf seatbelt, and informed me that I was Gru and needed to drive him to pick up his sister. 9:53 – Devon had started happily playing with his farm, so I thought I’d be productive and empty the dishwasher. 9:53:30 – Devon came into the kitchen and asked for my help with a tractor. 10:15 – The boy informed me that he was hungry, so we had a snack – cheese and crackers. Devon got crackers out for each of us while I sliced the cheese. He was a great helper and was rewarded by eating part of my snack as well as his. Sneaky boy. 10:22 – Devon had a quick tantrum, because I wouldn’t give him more snack. And then I had the nerve to tell him it wasn’t time to go pick Chloe up yet. 10:25 – We sat down to read books. And more books. Then a few more books. 10:55 – Devon’s diaper was dry again. So he peed on the potty again! Every time he goes on the potty, he gets a jellybean or M&M. I also took a quick trip to the bathroom and Devon offered me a jellybean. How thoughtful! That never happened at my old job! 11:05 – Devon and I started loading up in the bike trailer to go get Chloe from school. Devon fell, bounced and hit his chin on the driveway. We went back inside, got him cleaned up and got him an ice pack. Then we were on our way to get the sister. 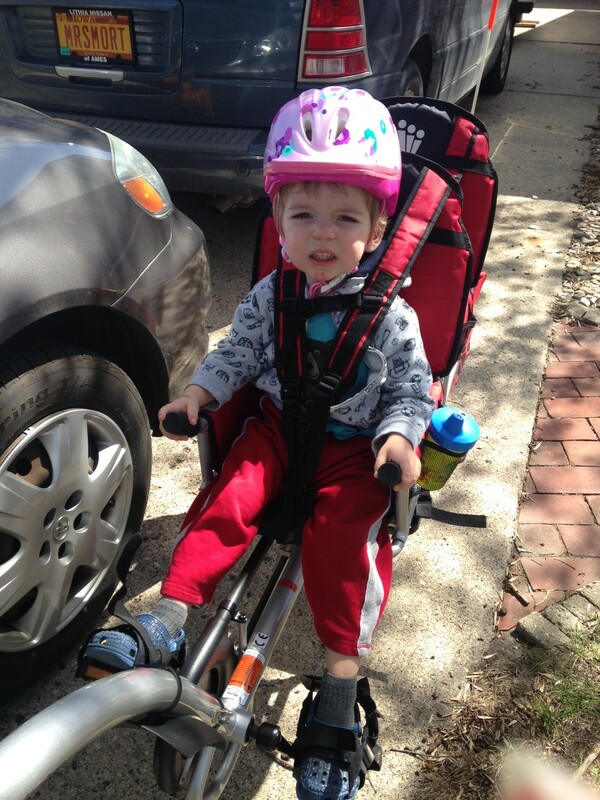 Despite his scraped up chin, Devon was very excited for the bike ride to get his sister, because he got to ride in the front with his feet on the pedals! 11:30 – Chloe was picked up and we were riding home when she informed me I was hilarious. Complimented on the job – awesome! 11:45 – The kids played outside while I got lunch ready. I only had to go outside 3-4 times to help them out while I was reheating leftovers. 12:21 – We had a science lesson while we watched ants carry away crumbs from lunch. 12:30 – I cleaned up and cleared out the yard so Aaron could mow the lawn tonight. Every 30 seconds or so, I gave Devon a push on the swing or watched a performance by Chloe Mae. 1:00 – I headed into the garden to work on preparing it for planting. I quickly had to go back to the garage and get the kids their shovels, then inside for proper garden footwear for the kids. They kindly “helped” me prep the garden. 1:35 – My boy impressed me by (can you guess?) peeing on the toilet again! 3:42 – Devon woke up from nap and we starting reading books. 3:51 – In the midst of reading, Devon turned to me and kissed me on the cheek. Oh, cute boy. He knows how to melt my heart. 4:20 – Chloe woke up. We continued to read books. 4:35 – The kids had snack while I read more books. 5:00 – I built the kids a quick fort, then they played nicely together while I started on dinner. 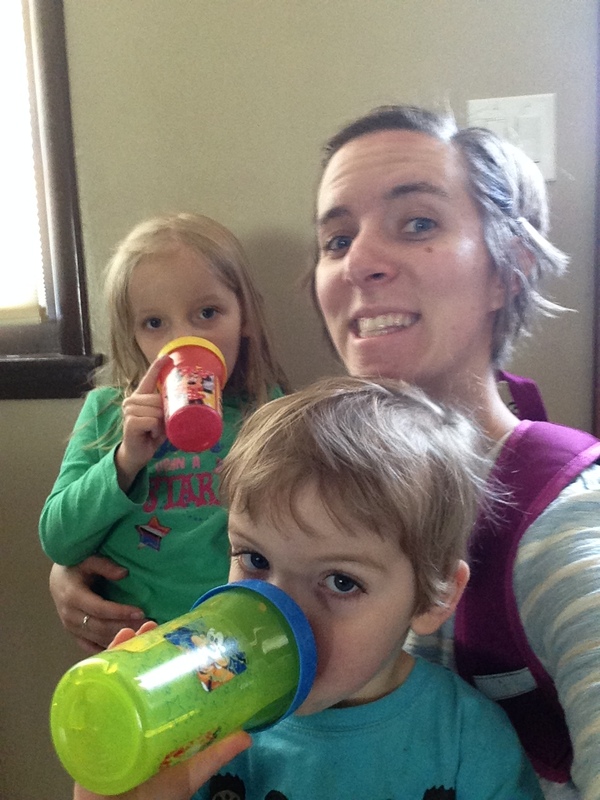 5:31 – My husband walked in the door and my work day was over. Then it was just on to the normal nightly duties of feeding the kids, entertaining them while Aaron mowed the lawn and getting them in bed. No big deal. I can do this again, and again, and again… Right?